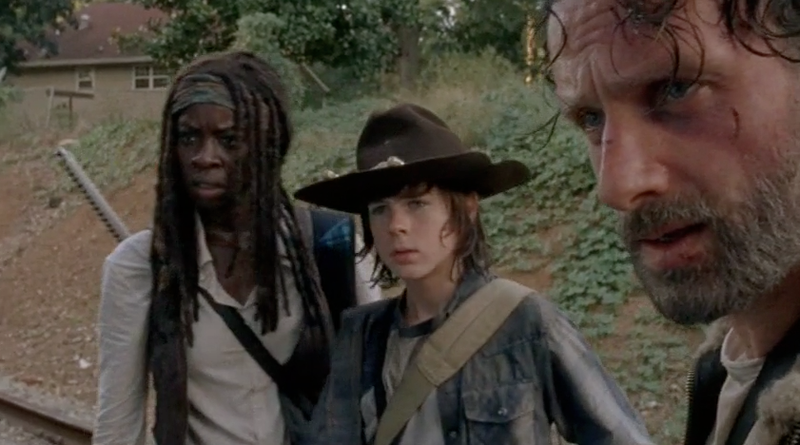 Rick, Michonne and Carl have taken shelter in an abandoned house in a fairly quiet neighborhood. 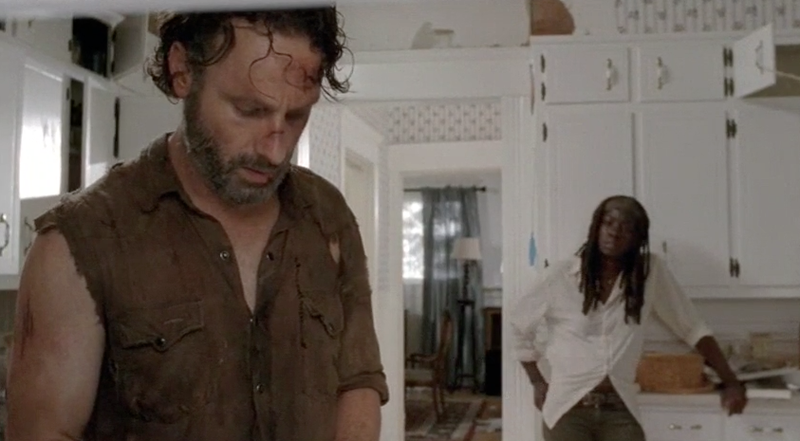 Michonne realizes that Rick needs another day to recover from his injuries. So along with Carl, she sets out into the surrounding community to secure supplies. The two find a can of aerosol cheese and a few other items in the first house. As they explore the second house, Michonne reveals to Carl that she had a three year old son. Carl is instantly intrigued and peppers her with more questions. Michonne agrees to answer only one question per room; and only after they have cleared it. As they search, Carl learns that the little boy's name was Andre Anthony. And that he died after the turn. 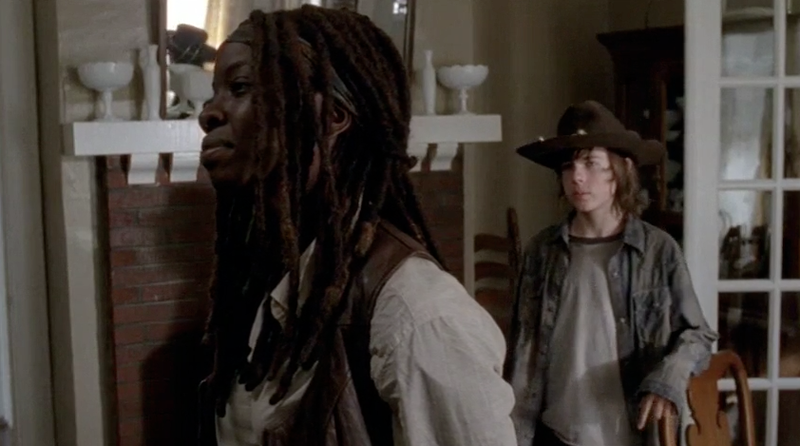 Carl promises that he will keep Michonne's secret. Although she insists it is not a secret. 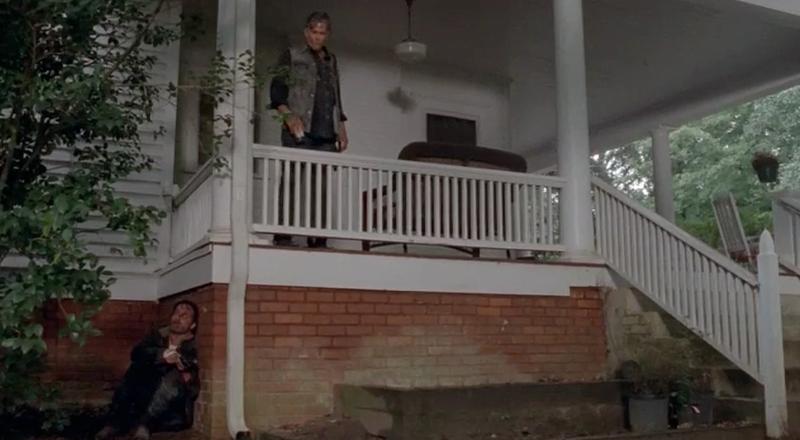 Upon finally returning to the house, they discover Rick crouching on the ground below the front porch. In their absence, the refuge had been invaded by a group of violent thugs. Rick barely escaped their notice as he fled. The trio run away from the house as fast as they can. They had no time to spare and as they flee, they begin to follow the train tracks. 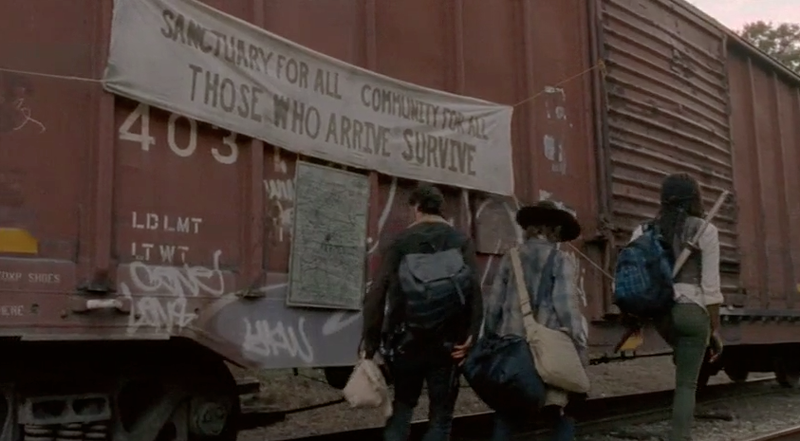 After traveling for some time, they come upon a cloth banner announcing the existence of a "sanctuary for all" and a plastic-wrapped map directing them to "Terminus." It appears that this is now their best hope, and they immediately set off for this new destination. 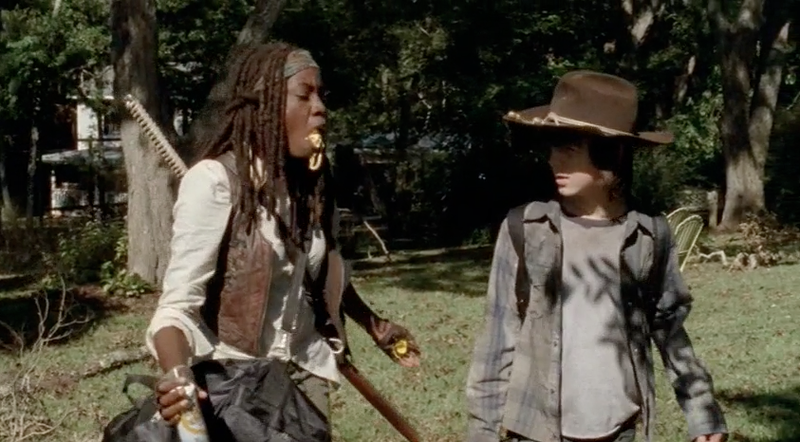 Michonne's aerosol "Crazy Cheese" was an excellent find. 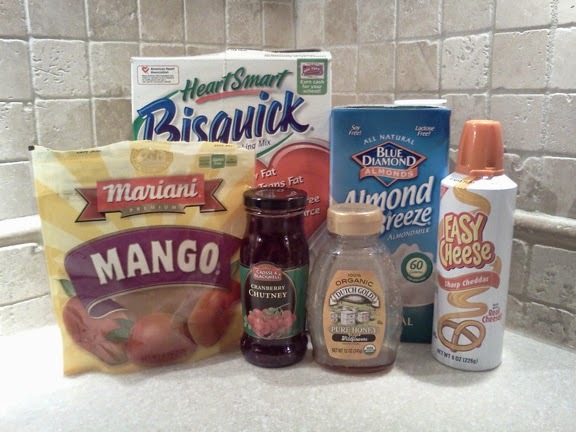 They no doubt, were also able to locate some other pantry staples as well. With prepared biscuit mix, chutney (or jelly), and dried fruit, the lowly "Crazy Cheese" becomes an over-the-top gourmet "Sarnie" (that's a sandwich if you weren't sure). Make them to take along on your next scavenging mission. And when the dead rise; remember the rules of the game, my Friend. Preheat oven to 450°F. Alternately, heat campfire coals to red hot and allow to burn and cover in white ash. In a large bowl, stir the baking mix and milk together until a soft dough forms. Sprinkle a clean, flat surface with additional baking mix. Turn out biscuit dough onto prepared surface and knead gently 8 to 10 times. Pat out dough into a circle that is 1/2 inch thick. Cut with a biscuit cutter or use a knife to cut into circular shapes and place in a greased cast-iron skillet or Dutch Oven. Place in preheated oven and allow to bake for 7-9 minutes or until golden. Alternately, cover skillet tightly with foil and place over hot coals. Allow to cook for 4 minutes and rotate skillet. Cook for an additional 3 minutes and recheck. Biscuits are done with they are golden and the tops spring back lightly when touched. To assemble Sarnies: As soon as the biscuits are done (and while they are still warm), split each using a sharp knife. Spread the bottom half with 1 Tbsp. Cranberry Chutney. Then top with 1 slice of dried mango. Top with a generous dollop of "Crazy Cheese" and finish with the other half of the biscuit. Serve immediately. 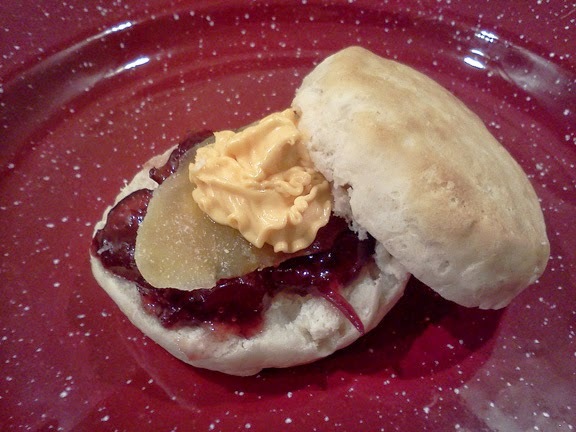 For an additional treat, drizzle the underside of the top biscuit with a tiny bit of honey.